10 Feb Just a Little Thing Called Progress! It’s been a little over 10 days since we at Uncover Ostomy launched the “Where’s Your Ostomy” effort and I cannot be more thrilled with the progress we have all been able to make! It’s been huge guys. In just 10 days, we were able to show, educate, and (hopefully) change the minds of over 2,400 unique visitors to the Uncover Ostomy website! We have sold some tshirts! In the past 10 days, we have been able to sell 56/75 “This is where my ostomy is” tshirts! In 10 days- that’s pretty awesome! Unfortunately – we’re not quite there. Remember: the tshirts will not be produced and shipped unless ALL 75 shirts have been sold. The sale is only on until February 21st, 2013 so NOW is the time to buy. If you have not done so as of yet, please make sure to purchase your shirt now! Also please make sure to share the shirts with all of your friends so that we can hit that number! We have also only sold 33/100 “This is where my ostomy would be” tshirts. This sale is also only on until February 21st, 2013 and works through the same process. We don’t process and ship them unless all are sold before the deadline. Please share! The last blog post I wrote, in which I detail the new launch, saw a record number of Facebook likes for any blog post written! Uncover Ostomy reached over 19,500 people through the Facebook page! Yeah. 19. Thousand. And 500. People. REACHED! We also saw an insane increase of 186 new Facebook likes! 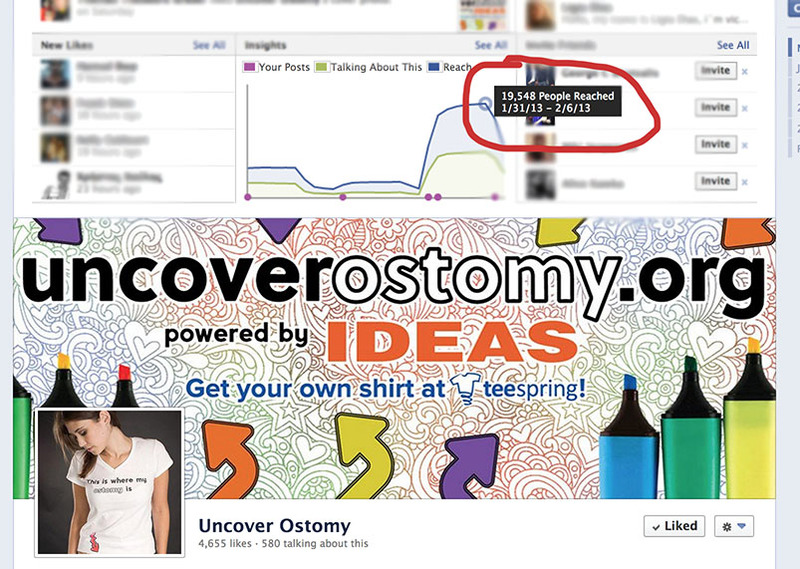 In just these past 10 days, 186 new people have liked the Uncover Ostomy Facebook page! That’s the biggest increase in such a short amount of time that we’ve seen in a very, very long time. Uncover Ostomy was on Global News in Canada! To top off all this exciting news, on Thursday, Feb 7th, Uncover Ostomy was the featured health story on Global News by health reporter Beatrice Politi! Not only was the campaign and the video featured, but after the story was over, the news team continued to talk about ostomy surgery and it’s importance! You can’t BUY that type of PR! These past 10 days have been absolutely unreal. We are doing it, guys. We’re changing minds. I’ve passed this on to someone who can get it fixed.